Rendering small glowing particles seems to be a thing I’m doing a lot of at the moment. One thing you discover really quickly is that particles that end up smaller than one-pixel wide in the rendered image need plenty of samples to avoid flickering, as it’s easy for the camera rays to miss them completely on one frame, then hit them squarely on the next. It’s a real pain if you have a camera moving towards or away from particles, as you generally have to set up the render for the worst case (furthest away), which can mean loads and loads of samples, and really slow renders. The solution is obvious, really: make the particles bigger. Ultimately, the end result we want when we render a particle that happens to take up half a pixel’s area, is a pixel that’s half “on”. So: we need to take any particles that end up on screen smaller than a pixel, enlarge them so they now take up a whole pixel, and drop their opacity (Alpha) to compensate. Note: this approach works great for particles that emit light – so it’s great if you’re doing UI or visualisation work, or streams of sparks, fireworks, star fields etc, but if you’re doing solid particle stuff, where their material has a diff and/or specular component to them, you’re on your own. This may help, but it may just make your renders look wrong and strange. But I do a lot of glowy sparkly particle stuff, so I’ve been wanting to do this for almost as long as I’ve been playing with graphics, and now I’ve found Houdini I’ve finally got the tools I need to do this. I’m guessing that this is a Thing that all seasoned professionals have been doing for ages anyway, but here’s a little explanation ‘cos I’m quite proud I got there on my own. The whole process only takes a single wrangle, and once set up, it can be saved as a preset and just dropped onto the end of whatever particle/points setup you have. We need to know how large in pixels each point/particle will end up when rendered with a camera a certain distance away, a certain focal length/film aperture, and with a particular resolution. The resolution matters because of course, all other things being equal, a scene rendered at 1080P has smaller pixels, effectively, than if it were rendered at 720P, so it’s getting more samples/rays thrown at the scene, and will be able to resolve smaller details without our help. I’ve put comments through the code below, so I won’t repeat it all here, but basically (at the risk of repeating myself) we plug the camera’s dimensions, and the distance and size of each point, into a formula to find out how many pixels wide it’ll end up. Then if it’s smaller than our threshold, we scale it up in size and down in Alpha. Download here: Resizer_test_scene.hiplc May contain nuts. If you don’t have Redshift installed, you can safely ignore any “redshift node stuff not found” errors and just play with the Mantra example instead. You’ll find a couple of identical test objects, each with this resizer-wrangle on them. Pick one and try rendering the before and after nodes to see the effect. Here are the parameters I set up on the wrangle: For the most part you can just leave everything at their default – just make sure you point it at your scene’s camera. Dome projection: uses a different way of calculating resultant pixel sizes: dome projection cameras have an effective focal length of zero, and no meaningful film aperture (size). Calculations are based on an equidistant (not equisolid) projection as that’s what I need today. So there. For the most part, you can just drop this onto any bunch of points, and make sure the camera parameter is set to your current camera. Redshift vs Mantra: I don’t use Mantra much (or at all), but the wrangle will work in the same way. The file below has a Mantra example in it too: the render looks subtly different but the benefit is the same. Keep global point scales at 1.0. Make sure that any Point Scale (Mantra) or Global Scale Multiplier (Redshift) on the object node itself are set to 1.0. Do any scaling and sizing before this resizer node, or use the Pre-multiplier on the node itself. Your material needs to handle Alpha. Because we need to be able to reduce the opacity of points, whatever material you’ve assigned must read and use the @Alpha point attribute. In Mantra, you’re probably using the Constant material or something similar: make sure Use Point Alpha is ticked; in Redshift, plug an RS Point Attribute (“Alpha”) into the material’s Opacity input. Don’t use resolution overrides! The camera resolution figures in our equations: we’re getting that information from the camera object. 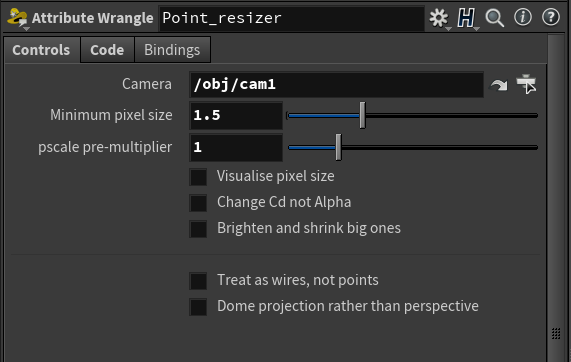 Most renderers will let you override it for previewing, letting you render at half- or quarter-resolution, but our wrangle won’t know that’s happening. So if you need to knock out smaller preview renders, reduce the resolution on the camera object, rather than asking the renderer to override it. Or live with the consequences. Real cameras only, gah… One (annoying) caveat: this does not work nicely with Camera Switcher objects. Although a Switcher is supposed to be a perfect doppelgänger for whichever camera it has selected, it doesn’t pass through all the parameters we need. So beware. Now it’ll be there any time you need it. Just drop a wrangle down and choose the preset.